↑ "William James: Writings 1878–1899". The Library of America. 1992-06-01. Retrieved 2013-09-21. ↑ "William James: Writings 1902–1910". The Library of America. 1987-02-01. Retrieved 2013-09-21. ↑ Dr. Megan E. Bradley. 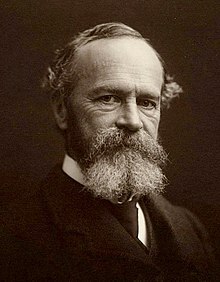 "William James". PSYography. Faculty.frostburg.edu. Retrieved 2013-09-21. ↑ "William James". Stanford Encyclopedia of Philosophy. Center for the Study of Language and Information (CSLI), Stanford University. Retrieved 2013-09-21. ↑ James, William (2009). The Varieties of Religious Experience. The Library of America. pp. 74–120. ISBN 1598530623.